I have a huge collection of seashells and I have been collecting them for years, I use them for decorating in so many ways. I have shells in my bathrooms with soap, I have huge shells in the garden filled with water for the birds. 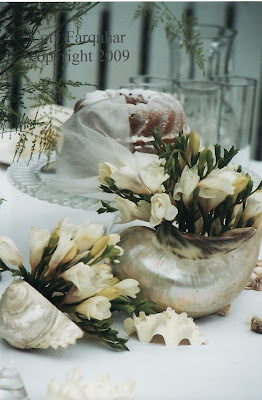 Here I have used my shells as the centrepiece for this table setting. 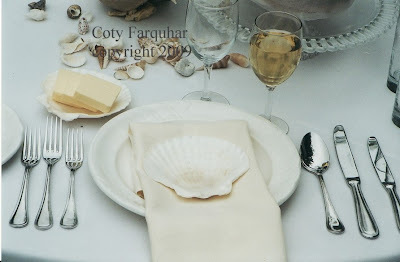 White tablecloth, white china, cream napkins and many different shaped shells. 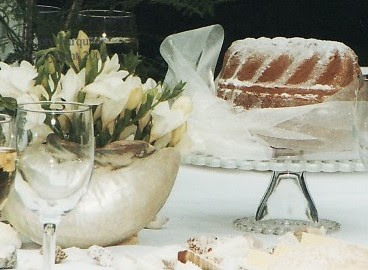 I dusted everything with white, the cake with icing sugar, the bread with flour. Coty, I love this! I could see this for an evening garden party under the moonlight or for a bridal shower...the white would be sooo romantic! Thanks for sharing this gorgeous table. Stunning , love the shells and all of it! Your photography is breath taking too. Just so elegant Coty, without being stiff & formal. I think shells offer a certain kind of ambience, you really have weaved your magic with these settings - bravo to you! Thank you for your kind words over @ The Hedge today. It means a lot to know others have gone through a similar experience. Stunning, as always! I swear you need to do a book! My friend jain at Once on a Blue Moon told me about your gorgeous blog. I hope you won't mind if I add your link to my sidebar. I LOVE your blog. 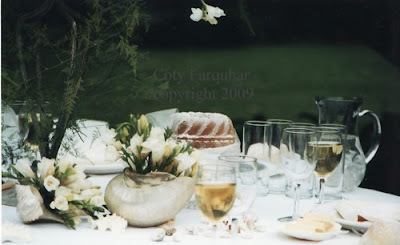 Coty, so glad to see you have joined Tablescape Thursday!! 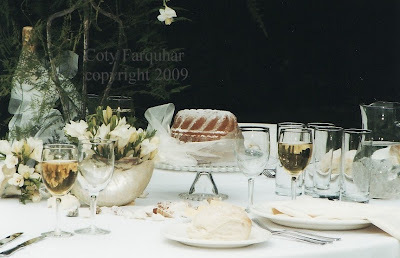 I am sure the other women will drool over your table settings and your blog , as I have for months now!!!! 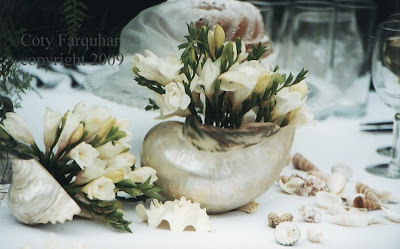 I've always loved putting cream color flowers inside seashells. 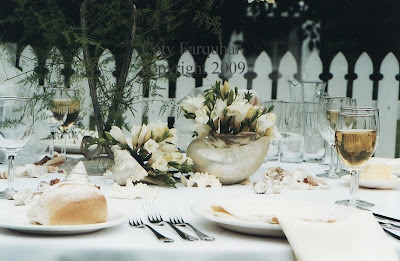 Not only do they look stunning here on this beautiful tablescape but also in bathrooms! Thanks for the reminder. Just divine! Love it all! Breezy and dreamy! Just lovely! Beautiful table and what a good idea to use shells. And I must say your cake looks delicious. Wow! Gorgeous and Gorgeous! I sooo luv your garden, the roses, the blue agapanthus, I'm so envious. Your photography is divine. I just joined Outdoor Wednesday and when I read your blog, I'm now a fan!